The most advanced high bead and deep gloss spray detailer! 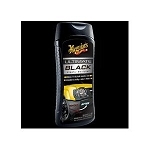 Meguiar's, the company that brought car enthusiasts the worlds first spray detailer, now introduces a revolutionary mist and wipe product that works like a spray detailer and enhances wax protection. This totally unique formula represents a significant breakthrough in technology that has even our eyes popping! 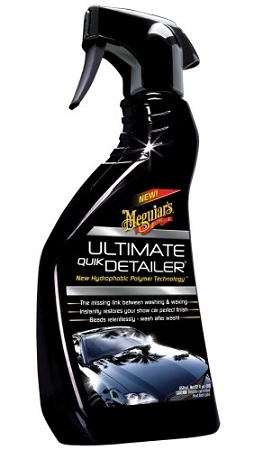 Through the use of new Hydrophobic Polymer Technology, Meguiar's has created a spray detailer that actually repels water, withstands multiple car washes, and adds additional protection to your finish. The secret lies in the high level of surface tension created when these revolutionary polymers react. The result is a slicker, darker surface and incredible water beading! You will feel your towel almost float across the surface. The gentle, high lubricity formula is safe on all paint types including the latest clear coats and can be used daily to remove loose contaminants, dust and grime to keep your car looking its absolute best. Its so easy, you can detail a full size car in less than 10 minutes!